Have baby, will travel. Tips and tricks from my daughter’s first plane flight at 10 1/2 months. The fourth of July has always been a big holiday on my father’s side of the family and since we live 1,600 miles apart, that requires either a really long drive, or a plane flight. It was only a matter of time after becoming parents that we would have to bite the bullet and fly with the baby. In general our little girl is pretty laid back and loves to make new friends, but at 10 months, she is constantly on the go and very curious, so we were convinced we would have trouble containing her on a plane for several hours. Also, she is still on formula and with the TSA regulations how would we bring food and water for her? Well I’m happy to say that we were pleasantly surprised! 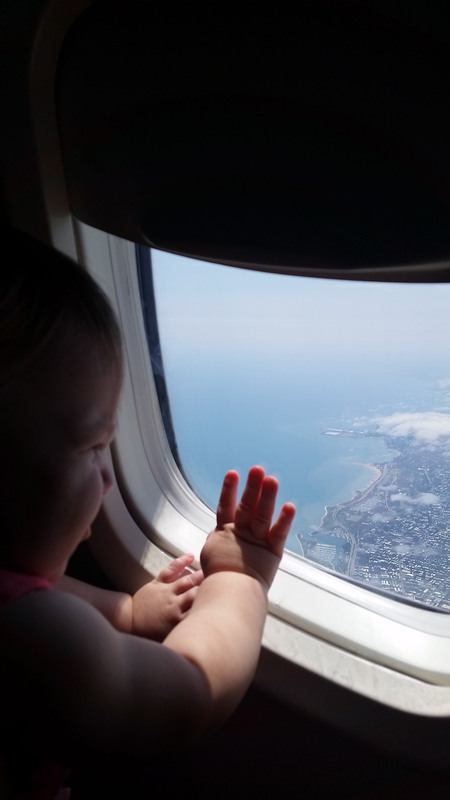 She did so well on each leg of our flights to and from our destination, so I am much obliged to share tips and tricks I learned about traveling with our baby. Please note: all green bold words are clickable links to handy products which made our travels easier. First I ordered formula, food and diapers from Amazon.com and BabiesRUs.com to be sent to our destination, that way we only had to pack enough for our flight and a little extra in case of delays. That was a huge help considering luggage for a family of three with a baby is already no joke! We did end up having to take some leftover items back with us so thankfully I packed a few reusable grocery bags to use as a carry on for extras. We also received some gifts for the baby which also made those extra bags a must-have. We managed to fit all of our clothes for the week in one large bag by rolling each piece of clothing and doing our best -to only bring one outfit for each day afew extra for the baby. I was also sure to pack warm and cool clothes for the baby as I was not sure what the weather would do and wanted to be prepared for anything. Thankfully, her clothes are still small and do not take up much room. We packed all toiletries, bottles and sippy cups in one small rolling duffle bag. Bags with wheels are a huge help when you are carrying several items and the baby! We knew we would have a place to wash bottles when we got there, but we didn’t want to have to wash them all the time, (we would be on vacation after all) so we packed all we could not fit in the diaper bag in the rolling duffle bag. I also made sure to pack the baby monitor, a sheet for the pack and play my father borrowed from the neighbor so that her bed would smell familiar. (A note on the baby monitor: the one we packed did not have a range far enough to reach the waterfront in the back yard, so we actually ended up purchasing an inexpensive sound-only monitor when we got there and returned it after our stay. it worked great!) I transferred baby shampoo and lotion to travel size containers because that was cheaper and faster than making a trip to the store. In hindsight I over packed the diaper bag, but better safe than sorry right? I packed four empty bottles and two travel formula dispensers. (We use these all the time for her formula because they make it much quicker and easier to make a bottle than measuring out each scoop.) I planned to buy a bottle of water after getting through security. As it turns out, the TSA told us on our way back that we would have been allowed to bring water in the bottles as long as it was for the baby. We didn’t end up having time to get a bottle of water before our first flight so we asked the flight attendant shortly after finding our seats and they were very accommodating and got us all the water we needed. I also packed baby two baby food pouches which she could eat directly out of. Ella’s Kitchen is my favorite brand and the only brand my baby will eat. I also packed lots of wipes, several diapers, plastic bags like these for dirty diapers, a sippy cup for take off, (Having them drink when taking off and landing helps relieve pressure in their ears, a bottle will do the same.) a variety of small toys, (I tried not to pack the ones that made noise.) and a few burp cloths for any spills. Hand sanitizer and a small travel size dish soap were my only liquids. (The dish soap was just in case I needed to wash bottles because we were delayed. I didn’t end up using it but it was good to have for peace of mind.) I also packed my Kindle Fire Tablet and downloaded a season of Umi Zoomi episodes which proved to be very helpful when she got restless. We did not bother to bring the stroller because we didn’t want to have to worry about waiting in line to retrieve it after every flight as we purposely booked short layovers. Instead we brought the Ergo Baby Carrier and it worked like a charm keeping my hands free and I just stored it in my reusable grocery bag when not in use. Another must have was this car seat cover. It has a shoulder strap which was amazing to help my husband carry it and pull our large clothing bag. This to me is a must to protect the car seat from getting dirty. The attendant at check in said that some people think they have covers there and they do not so the car seats end up filthy. Car seats are checked free of charge on most airlines and with the cover we were able to also put an extra can of formula and her portable Chicco travel high chair in the car seat bag as well to save room in luggage and it got there safe and free of charge! We were very glad we brought the travel high chair as it came in very handy our whole trip! Since we were planning to do some swimming I also packed this reusable swim diaper I found so that I didn’t have to worry about packing the disposable ones! This is great if you have access to a wash machine or even a sink as you could pack a small amount of laundry detergent to wash essentials in the sink. On all legs I sat on the inside next to the window and my husband took the outside seat. Thankfully we were on small planes each time so there was not a third person to worry about in our row being annoyed by our little one trying to grab at their belongings or play peek-a-boo when they are trying to catch some Zs. I’ve heard a few things about sitting toward the front or the back of the plane to be near bathrooms, but at least for us, that didn’t seem to matter. On takeoff and landing I made sure to give the baby her sippy cup with water in it just in case her ears were to bother her, but fortunately she didn’t seem to have a problem. I was prepared with a bag full of every small toy and teething ring she owned and of course the only things she actually ended up playing with were the plastic cups the flight attendant gave us for our drinks and the window shade. Why didn’t I think of that? The classic buy an expensive toy and they play with the box scenario. The two things that did come in handy were the tablet with the Umi Zoomi shows I downloaded via Amazon Prime and my jacket. When she started to get restless and board I just started an episode and she watched about a minute or two and then fell asleep which I was impressed with because I am typically not in the habit of letting her watch shows yet, but was willing to do whatever it would take to keep her from being ‘that’ screaming baby on the plane. I used my jacket to cover her when she fell asleep and I was plenty warm snuggling with her. Diaper changing actually ended up being a breeze. I didn’t want to bother with taking her to the tiny bathrooms, so I just laid her on daddy’s lap in the next seat and changed her there. Thankfully there were no poopy diapers. I had the dirty diaper bags I mentioned earlier and I just wrapped them up and gave the bag to the flight attendant when they came by to pick up trash. Couldn’t have been easier that way! Overall I attribute the success of our travels to the convenience of ordering essential but bulky items ahead of time, short layover times, (keep in mind this can put you at risk to miss a connecting flight, however fortunately it worked out for us and we didn’t have to wait long for out next flight.) very helpful flight attendants, the luck of the draw on fellow passengers that didn’t mind playing endless peek-a-boo games with our little one and last-but-not-least a very laid back child! Quick brag warning!! We even had a few fellow passengers comment on how good she was and what a joy she was to play with on the flight! I hope this post has helped to make your travels smoother and ease your worried mind! Feel free to share any travel tips I may have left out! Just because, here is a pic of my little one playing in the window of the plane. My daughter made me a hippie! Okay, it’s time to admit it….I’m on the fast track to officially becoming a hippie, or at least what I used to think of as one. Any time I would see someone with their own garden, bringing their own bags to the grocery store, buying a cart full of produce, making everything they cook from scratch I would smirk and think really? What a hippie! As if it were a bad thing? Well, you live and you learn and 11 months into parenthood, (well really 20 months in because I consider myself a parent from the moment I conceived.) here I am doing every one of the things I mentioned, not because these things are now becoming popular and cool, but because I feel they are the right thing to do to provide the best life I can for my family. Growing your own garden saves money on produce and ensures that there are no unknown chemicals used on the fruits and veggies you put on your plate. Okay I don’t quite have my own garden yet, but I plan to very soon. Hopefully I also grow a green thumb because as of now, I can’t even keep a cactus alive.Time to do some research on gardening! Bringing your own bags to the store just makes sense. It produces much less waste and a lot more fits in them, so it’s less trips from the car to the kitchen. Everyone wins! I recently bought my first cart full of produce due to the Whole 30 diet my husband and I have committed to and making everything from scratch ensures great tasting food and you know exactly what’s in it. No preservatives needed and no worries of what it will do to your health in the future. You’re probably thinking, okay so where does your daughter come in to this picture? Well it started with my curiosity about the ingredients in her formula which you can read about here and it has slowly progressed from there. Like most parents I am hellbent on doing everything I can to provide nothing but the best for my child. Therefore, when she started showing an interest in what was on my plate, I figured I’d better clean up the contents of that plate. Hence Whole 30 which you may read more about here. In cleaning up the contents of my plate I’ll live longer which is better for both of us. Using reusable bags over several years will significantly reduce the amount of wasted plastic bags that ultimately go into landfills and make the future world just a little cleaner for her and her children. Making everything (or most things) from scratch will teach her the art of cooking which is slowly being lost due to prepackaged, processed foods, not to mention that it will keep all of us much healthier. I will never claim to be anywhere near perfect, but I am really making an effort to take a good hard look at my lifestyle and habits because I now have little eyes watching and learning those habits. The food I eat, the company I keep, the music I listen to, the books I read, the shows I watch and the church I attend or don’t attend, everything I do, can make a profound impact on my children and there is no better time than the present to start leading by example. A huge thank you to my daughter for giving me the inspiration to be an even better version of me and continue to improve every day because her future and mine depend on it. Have you “become a hippie” since your child was born? Feel free to comment. I’d love to hear about it! My Mom shared this post with me one day when I was really struggling with being a new Mommy with major sleep deprivation and some major self-doubt. As you may expect, it made me cry, but it also helped me to change my perspective a bit and learn to live in the moment and savor every precious moment with my little one. Click here to read this wonderful inspirational post that will show you just how a simple jar filled with 936 pennies can change your entire view of your child/children and how you raise them. I don’t believe I asked for your opinion thank you! You just found out you’re going to be a mommy! You let it sink in for as long as you like before shouting it from the rooftops and then…BAM!!! There they are, all of the well-meaning advice givers and unsolicited commenters. Somehow all of a sudden everything from diaper brands to just how close you are, or actually are not, to having that baby seems to be fair game. Either way, do your best to just shake off the comments and any aversions you may have developed to mirrors, other reflective surfaces and stop trying to find the ‘right way’ to stand to make your shadow more flattering. Oh and avoid Target dressing rooms at all costs! (Many of them have front and back mirrors that left me in tears more than once. Remember at the end of the day, you are growing another human being and that in and of itself is amazing, therefore you are amazing! Every single ounce and inch of you! The next time you look in the mirror just picture yourself holding that little bundle of joy and smile knowing every moment of this will be worth it! I wish I could say that pre-baby comments are the worst of it. Unfortunately, this is just the beginning. You may want to mentally prepare yourself for the barrage that is about to ensue once you start toting that mini me around town. I once witnessed three people give nursing advice to a new mama friend of mine nursing her baby in the restroom of a church. One person even had the nerve to tell her that her baby looked small for her age right after she had finished telling me that she was worried that her milk supply may have been dwindling and she was worried about his weight gain! After seeing my friend fighting back tears, I wanted to give that lady a piece of my mind, church or no church. In the midst of all the opinions and advice, what’s a mommy/parent to do? Be confident in your parenting choices, all of them! You alone know what is best for your child and your specific situation and you make the best choices you can for your family. Period. End of story. You do not have to defend your choices to anyone, not even family. Thank them for their opinion if you wish, consider the few good points some may have and apply what you feel is best for you and your family and don’t apologize to anyone for your choices. No one is perfect, but you learn from your mistakes, you do research and make the best informed decisions you can and that’s all you can do. At the end of the day, walk tall and show off that beautiful baby/baby bump because in the end somewhere deep down all of those opinions and put downs won’t matter one bit the next time you hear that little giggle or get that goodnight kiss. I exclusively breastfed for the first 5 1/2 months until the complications I was having outweighed the benefits for our family. (That will be another post.) There is an extreme amount of pressure placed on new mothers to breastfeed for the first year which caused me great anxiety over making the switch. Like most parents, I only want the best for my child, so I did tons of research on which formula may be the best option. My concerns began when I took a look at the ingredients in the leading brands Similac and Enfamil samples I had received by mail and was shocked to read that the first ingredient in both brands was corn syrup solids. (Corn syrup solids are not the same as high fructose corn syrup, they are used as a form of carbohydrates which replaces lactose in formula when allergens are a concern, however it still bothered me that this was the first ingredient.) Before I continue, I do realize that there are thousands of babies exclusively fed these two brands of formula and they turned out very healthy, however I decided to do further research to ease my mind that I was giving my baby what I determined to be the best she could have since I was no longer able to offer breast milk and did not feel comfortable using donated milk as I felt that formula was much more regulated and consistent. I read several articles and talked to several other mothers as well as my pediatrician who unfortunately offered little incite as to which brand was best to use other than to say that they are all very similar and any would do unless we found that she had allergies. This to me was like saying that eating McDonald’s daily was the same as eating a well-balanced diet of whole foods. There had to be a difference somewhere. Two articles in particular proved most helpful in making my decision. The first article is on the ‘food babe’ blog. Please note that I am not in the practice of trusting my child’s nutrition to someone who calls themselves the ‘food babe’, however the guest blogger featured in this post has excellent credentials. The article breaks down each ingredient in layman’s terms explaining how they affect babies. Click here for the article. The most concerning ingredient to me was palm oil which causes ‘soaps’ in the baby’s gut. (Soaps also explained in the article.) This concern is further validated in the other article which takes a slightly more laid back, yet just as credible source. Click here for the second article. After careful consideration, I chose Baby’s Only Organic Dairy ‘Toddler’ formula. It seemed to me to be the best formula available in the United States as far as I could determine by my research. The only other viable options seemed to be HiPP or Holle which are European formulas which are only available on the grey market in the United States and are not regulated by the USDA. It seemed to me that even if these two brands had slightly better ingredients, there was a chance I would not hear about any recalls and if there were recalls, I would most likely be forced to dump out my investment instead of having them replaced as I would be able to do with American made Baby’s Only. There is some confusion with Baby’s Only as the can clearly reads ‘Toddler Formula’, however upon further review of the back of the can it is labeled this way to encourage breastfeeding for the entire first year. The formula is perfectly fine to for infants from birth on. Another concern that often arises is DHA and ARA. Baby’s Only offers a formula which is specifically labeled with DHA and ARA, however the plain dairy version also states on the back that it “includes Alpha-Linolenic and Linoleic Fatty Acids the human body converts to DHA & ARA. These fatty acids are found in breast milk and are important to brain and eye development.” (See previously referenced food babe article which states that these supplements may be more of a marketing scheme than they are actually beneficial for babies. Apparently Nature’s One is no different.) Because of this, I see no need to spend extra for the can that is labeled “with DHA & ARA.” That being said, if you so choose to purchase this version take note that Baby’s Only with DHA contains the only organic compliant form of DHA available. They use a process involving egg yolks which no other brand uses. If you would like to know more about Nature’s One products concerning Non-GMO and their DHA process please click here. 11 month update – As we enter our last month on Baby’s Only Organic formula I have not one single complaint. My baby is happy and healthy and meeting all of her milestones and the pediatrician says she is in perfect health and thriving. I am very glad I did my research and know that I am giving my baby the best formula in the US! As soon as you find out you are pregnant you will inevitably start being bombarded with marketing ploys to get you to buy everything under the sun that your baby will ‘need’. Somewhere down the line you find out that you didn’t actually ‘need’ half of the things you were told you did! Here are a few things, most of which I ended up purchasing after the baby was here, that actually made life easier for both me and my baby. Ergo Baby Carrier – I don’t leave the house without this thing! I tried several others before finally asking around with friends and several online forums and reading a blog that a chiropractor wrote recommending this one. I can carry my little one around in this for several hours and not have a back ache. I get my grocery shopping done while she naps or is content the whole time! When she was little and didn’t want me to put her down, the ergo allowed me to get things done around the house. One tip I never had to try but I have read works is if they are too big for the infant insert, but too small to be comfortable without it, fold up a small blanket and suff it in the bottom and let them sit on that. Fisher-Price Deluxe Auto Rock ‘n Play Sleeper – If you are like most parents, your baby will sleep in your room for the first few months and everything you read suggests that they sleep in a pack and play (play yard or playpen) or a bassinet. While those suggestions work for some babies, the rock ‘n play ended up being a life saver! Why is it so great? It’s small and compact so it can fit right next to your bed even in a small space which is really nice when your baby is waking up to be fed several times at night, it folds up and can easily be taken with you on the go, this particular model rocks itself which made my baby sleep for 5 + hours at a time most nights, it’s inclined which is great for babies that suffer from acid reflux, it is small and makes them feel secure as opposed to a pack and play and even some bassinets that can make them feel as if they are vulnerable. (If you think about it, they are used to the womb which is a warm tight space, so a pack and play may feel huge and scary!) This model also offers music and white noise which I later found out, white noise is an amazing sleep aide for babies. (Going back to the womb, it’s not quiet! Baby can hear your heart beat, voices and a multitude of other sounds in your environment, so loud white noise actually helps them to sleep.) One downside to this model is that the automatic rocker is a bit noisy and took me and my husband some time to get used to. 4Moms Infant Tub – I was lucky enough to find this item second hand but still new in the box, otherwise I probably would not have spent the money on it, however looking back, it totally would have been worth every penny had I paid retail! As first time parents we had no idea what temperature the bath water needed to be at and this tub takes the guesswork out of it with an on-board thermometer! It fits perfectly in a double sink and comes with a cup for rinsing as well as a cup holder which is very convenient. (The less I have to search for things, the better in my opinion.) It has several drains which allow fresh water to circulate around the baby while not getting too deep even for a newborn and continually flushes out dirty water so that your baby is not sitting in their own dirty water throughout the bath. I really can’t say enough good things about this tub! Graco Relay Click Connect Performance Jogger Stroller – I have had this for about two weeks now and I just love it! It has great shocks which absorb most of the impact from rough roads or gravel and a nice padded seat to keep baby comfortable. My Graco Click Connect infant car seat clicks right in snugly and allows my baby to see me while I run even with the sun shade down as it has a peek-a-boo mesh flap which can be opened or closed with velcro. It has a locking front wheel which makes it very stable and smooth. It folds up easily and has a convenient pocket for water bottles, phone and keys. There is also a storage compartment underneath the seat big enough for a diaper bag so you have everything you need. Running with it is much easier than I thought and so far my longest run with it has been 3.5 miles. Please note: Graco also makes a similar jogging stroller which is at a lower price point called the Fast Action Jogger, however it is my understanding that this version does not offer the shock system and there are several complaints about the sun shade snapping closed as soon as you start to jog. If you’re a serious runner like me and don’t want to spend the extra money on the BOB strollers, I highly recommend the Graco Relay. Baby Einstein Neighborhood Friends Activity Jumper – My baby LOVES this thing! She has gotten to the point where if she is not in it and wants to be she will start jumping in my arms and reaching for the jumper. I love this one because it has adjustable height, many different activities with a swiveling seat which allows me to turn her toward another activity station when she gets board with the one she is facing, the seat is removable cloth so that I can just throw it in the washing machine and the little piano has loud, quiet and off settings which I wish more toys offered! My little one is happy in her jumper for up to about 30 minutes which allows Mommy to get household chores done (or write this blog) with a clear line of site to my happy baby. Aquaphor Baby Gentle Wash and Shampoo – It has been drilled in my head for as long as I can remember that Johnson and Johnson babywash was the best thing on the market, so naturally that’s what I got when my baby was born. It worked fine in the summer months, but once winter rolled around I could not fathom how or why my 3 month old’s skin was so dry even after a daily lotion massage. I mean, she is a baby and there is a reason they say baby-soft skin is all the rage right? Well little did I know, it was the shampoo and lotion that was drying her out! I switched to Aquaphor and presto! My baby’s soft skin came back in less than 24 hours! Ubbi Diaper Pail – Okay, I think that we can all admit that smelly dirty diapers are one of the least favorite parts of bringing home that little bundle of joy and it seems to me that the Diaper Gene is all the rage, however it requires specific trash bags and apparently is a huge pain to empty with a twisted mess. The Ubbi uses everyday trash bags, is easy to empty and reload, locks so that toddlers can’t get into it and it really blocks the smell! What more could you ask for? Do you have an item you can’t live without that’s not listed here? Feel free to lave them in the comments.